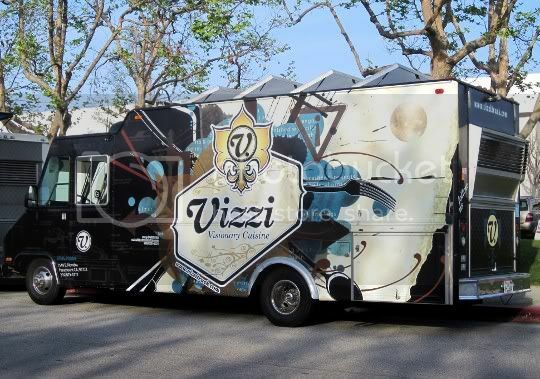 Vizzi Truck (short for "visionary") is the kind of gourmet food truck that lives up to its name: it actually includes TVs and a sound system for diners' amusement and entertainment, and more important, it features seasonal menu items with some of the most unique ingredients and combinations I've ever seen from mobile cuisine. The truck that promises to "stimulate all your senses" and "seduce your taste buds" is all about "coastal-infused cuisine." I find the menu to be quite intriguing, with items aptly titled "inspirations." There are a range of sliders that seem to stay on the menu year-round, while the salads, soups, sandwiches, and other items change with the season. That's right, Vizzi Truck has a winter menu that completely differs from the spring menu. I suppose this has its pros and cons, but I do like the idea that they keep things fresh, and in my opinion, the seasonal menu change certainly adds to the following allure. Although their menu options are pretty limited for veggies, I would definitely say they still uphold their promise. The truck is also known for its spiced popcorn (which I think varies by the day? ); I witnessed quite a few diners buying bags of it and nothing else. Well my senses were definitely stimulated with this salad. Spicy, eye-watering, nose-burning horseradish dressing takes the main stage here...and although it seems almost painful to keep eating (yes, you may have to take a few breathers in between bites), it is SOOOOO GOOD. It's thick and creamy, and coats the mixed baby greens so well. 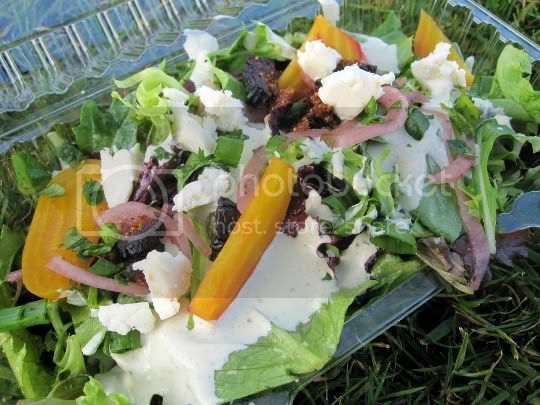 It's also slightly sweet, but most of the salad's sweetness comes from pieces of chewy dried figs. I was expecting more tangy pickled onions and those love-them-or-hate-them dirt-tasting golden beets; although I'm not a huge fan of beets, the juicy and mildly sweet pieces I did get worked well in the salad...not to mention the pretty color they added. The creamy, chewy, mildly flavored queso panela is an afterthought, as there are so many more dominating flavors. I'm also not quite sure where the "tagine" comes in here (the figs? ), so I think the name is a bit misleading. The salad is a great size for the money, and I found that I was actually quite full after finishing it off. I'd definitely order this again through the spring! These "vegetarian cutlets" taste like nothing more than tangy hummus patties on Hawaiian rolls...but that's a good thing. These sliders are so full of flavor, it's almost hard to believe these aren't being served in a restaurant. The patties themselves do taste like hummus, but they're also salty and tangy with a hint of smoky cumin. The additionally tangy, herbal chimichurri sauce is a great pairing with the sweet, moist rolls. I thought the patties would be a bit more crisp and burger-like in texture, but just be prepared for something closer to a hand-formed, pan-fried soft bean patty. Which, again, is a good thing; even my meat-eating friend tried them and said he would actually order them himself...which speaks volumes! 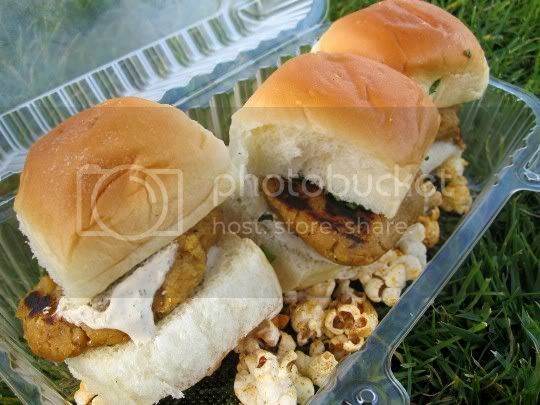 The sliders are housed on a bed of Vizzi's infamous popcorn, which I didn't think was anything outstanding, but it was nicely salted and spiced, and certainly an interesting pairing choice. Follow again? Definitely. Although their veg options are limited, they are memorable and worthile! Great take on this food truck. I like how they put much emphasis with the sound system and creating a perfect ambiance for their customers.